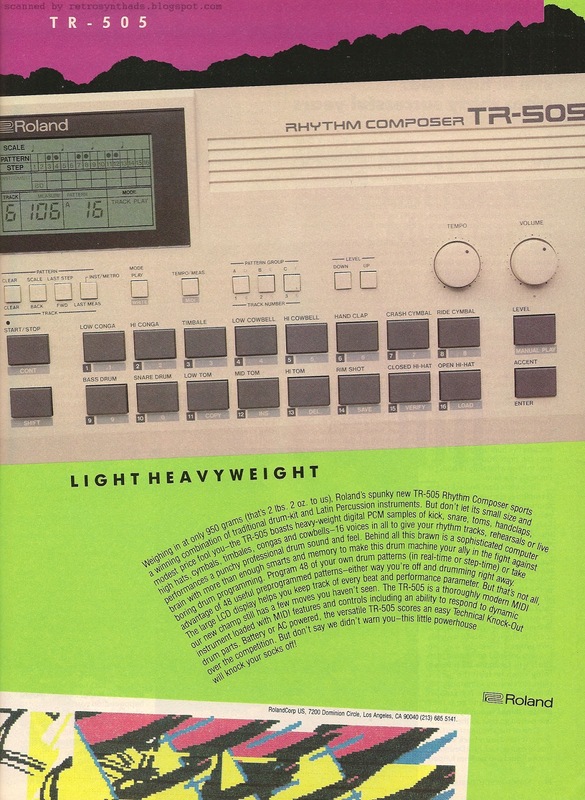 Roland TR-505 drum machine "Light Heavyweight" colour advertisement from page 17 in the December 1986 issue of Keyboard magazine. Also appeared on page 9 in the March 1987 issue of Electronic Musician. Well, it's Cinco De Mayo today, and I don't want to take anything away from that. But May 5 also has another name - 505 day! Sure, its not as celebrated as 303, 808 or 909 day, but to me it's part of the XOX family and deserved a little recognition. Hmmmm... not buying it, eh? Okay - I'll come clean. I have a personal soft spot for the 505. It wasn't the first drum machine I played on, but it was the first one I bought for myself. I spent hours programming the rhythm patterns to songs like Dreaming of Me and New Life by Depeche Mode into it, along with the bass and melody lines into the sequencer of my Casio CZ-5000. And I'm not the only one who digs this machine. Although review sites will often give the 505 a relatively low rating when compared to its brothers and sisters, it only drives users like me to become even more fanatical about it. For example, Vintage Synth Explorer only gives this adorable battery operated puppy two stars, but the user rating is a much higher 3.72 stars. Just look at some of the comments below the review. Yoiks! The ad itself looks to only have appeared once in Keyboard Magazine and Electronic Musician. I suspect its rarity can be attributed to the fact that it was released after the Super JX and right before the D-50. 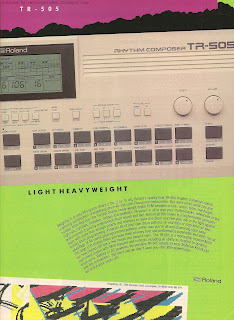 Roland only had so much ad space to allot to a budget drum machine when sandwiched between those two heavyweights. Technically, the 505 also appeared in another set of Roland Family ads - I'll get to those later. In fact, it was so far off the radar I don't think it even ever got a review in Keyboard. But, luckily, it did make it into Keyboard's Spec Sheet section back in June 1986. "Roland Drum Machine. The TR-505 Rhythm Composer features 16 PCM drum sounds, including five Latin percussion sounds. The unit is MIDI-compatible and has a memory capacity of 48 programmable patterns, 48 preset patterns, and six tracks, storing a total of 423 bars. MIDI velocity controls dynamic response. A cassette interface in included. The TR-505 can be powered with batteries or AC. RolandCorp, US, 7200 Dominion Circle, Los Angeles, CA 90040-3647"
I'm almost as fond of the advertisement as I am about the drum machine itself. Roland had been using this colour pallet for a number of earlier synths including the Super JX and Alpha Juno series ads. In particular, I love the low-res computer graphics that were becoming all the rage in the 80s, as MIDI and personal computers started becoming more common. Alas, this was to be the last ad to use the design style before the introductory advertisement for the D-50 took on a totally new 4-page look and feel. Read the whole thing and tell me it doesn't make you happy. As happy as I am right now on Cinco De Mayo!